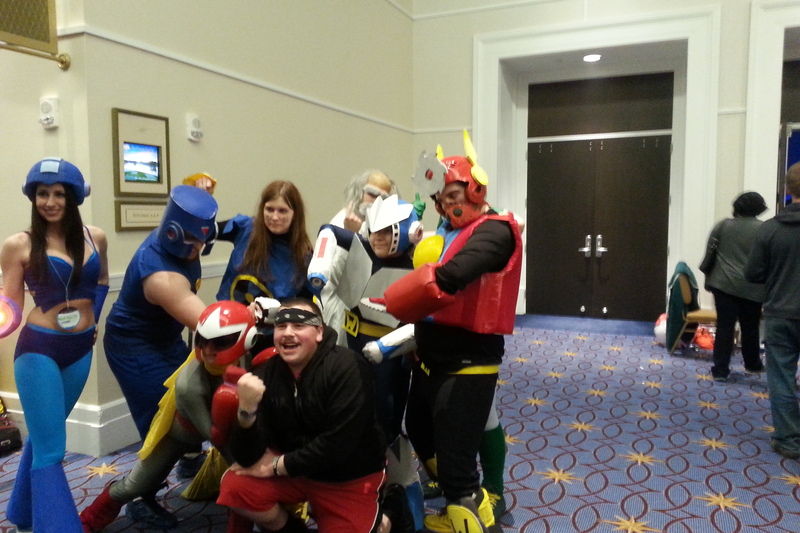 MAGFest 13 Delivers: I’m a believer and you should be too | Community. Reviews. Pwnage. These are just a few words that describe my reaction to what I witnessed on January 24th, 2015, as I spent an evening at the Gaylord Hotel and Conference Center in National Harbor, Maryland, attending MAGFest 13. I purchased my one-day Saturday ticket directly through magfest.org for $40 shortly before leaving and arrived at the Gaylord just after 7pm, finding free parking a couple of blocks away. Walking past the valet parking attendants and towards the Gaylord entrance I encountered my first of many MAGFest attendees and Cosplayers. It was an odd sight to see people dressed as characters in front of such a nice establishment, and this juxtaposition fought the extremely classy nature, marble floors, gazeebos, and beautiful chandeliers of the Gaylord all night long. Entering the building it quickly became clear, I will need to ask someone for directions to the MAGFest registration desk. While attendees were everywhere in sight, the activities or any signs were not. A helpful employee said: “Turn around, go down the escalator and turn left. Walk to the end of the hallway past the gazeebo and straight into the conference center area.” “There is an indoor gazeebo?” I thought to myself as I stepped on the escalator. If the valet parking out front or the beautiful rotunda and lounge area at the hotel’s foyer wasn’t enough, walking past the gazeebo on marble floor and looking up to see hotel rooms facing the atrium solidified that I was venturing to something completely different than MAGFest 8.5 or VGU-CON, a touch of class, pomp and circumstance, and awe. The excitement in me was rising, and it was palpable as I walked through larger and larger crowds of people and got closer to the heart of MAGFest. After a few moments I found the registration desk which seemed to have around eight people waiting in line. Happy to have prepaid I asked an attendant where I should go. She directed me around the corner through a pair of doors that opened into a large convention floor. Another attendant directed me to get in line to my left but I thought he was mistaken. “Wait, I pre-paid. I need to get in this long line of 25 people?” Yes. 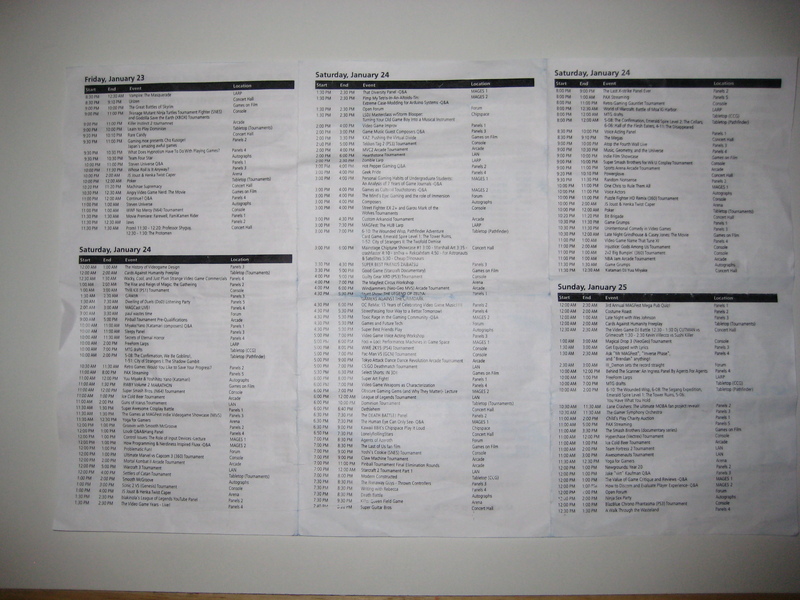 …And the list of esports went on. 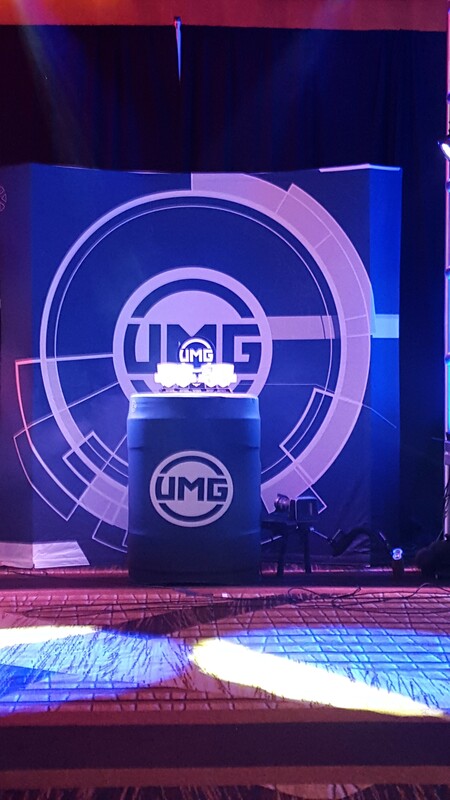 There were more esports I had missed on Friday and earlier in the day, and several more to come on Sunday and Monday. A-M-A-Z-I-N-G, I thought. Other events occurring within the next few hours included multiple interactive panels with a main attraction of You Tube stars Game Grumps at 10:30pm. There were also multiple bands rotating on and off stage in the concert hall, organized tabletop games, and gaming movies. Obviously, there was no way I could do a complete review of MAGFest 13 by being here a few hours on Saturday. You’d need a dedicated team of five or more people on each day to have a chance at that. The best I could do is report what I saw and witnessed, compare it to other events, and finish with my impressions and a recommendation for you. I quickly prioritized what I wanted to see and made my way towards the LAN room, wherever that was. On my way I walked through the large dimly lit arcade room full of new and old arcade machines. Many of the well-known popular classics were there, and the room was rather crowded and most machines occupied with folks enjoying themselves. The adjoining room was well lit and packed with vendors advertising their products and services. I was impressed with the number of tables and people walking through and stopping to view everything from old NES games to customized t-shirts, jewelry, and Cosplay gear. Past the vendors there were more video games in the THIRD adjoining room…and this was just the beginning. Exiting the vendor and gaming areas I weaved through the Gaylord’s beautiful hallways and common areas, walking past hundreds of gaming enthusiasts and Cosplayers on my way to the LAN room. Walking into the LAN room I was pleasantly surprised to see a full room of beautifully moded computers and gamers wearing headphones. Scanning the room I noticed a large wall sign for LANslide Game Center in Maryland, who had provided a number of the PCs for MAGFest. The CS:GO tournament had concluded but the LoL tournament was ongoing. The room was busy but yet had the quietness of concentration. I walked around the room checking out people’s beautiful mods and hardware. Next year I’m definitely brining my PC and staying a while. Exiting the LAN room with a smile, I found a nearby room that was live-casting the LoL tournament on a projector screen complete with two announcers providing commentary and plenty of seats to watch. This was far beyond any of my expectations. 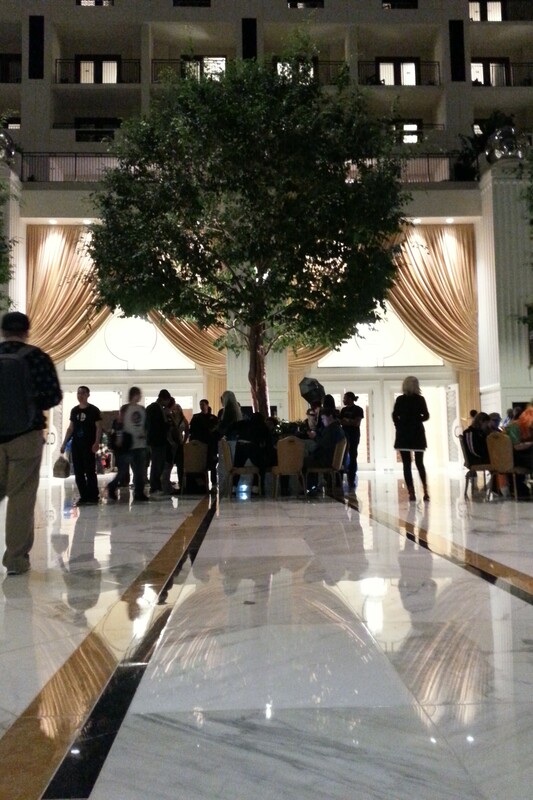 I stayed a few moments to listen and turned my attention to the rest of MAGFest. In one hallway I found a long line and inquired what people were waiting on. 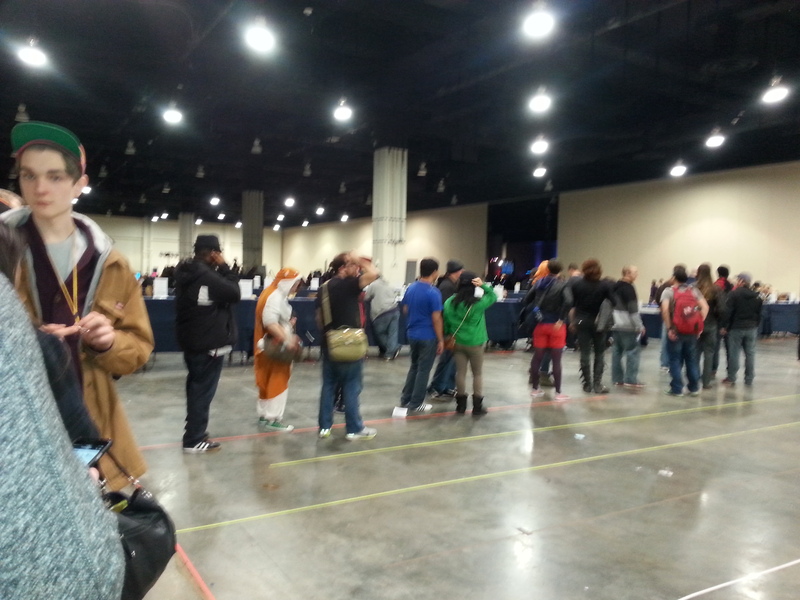 I was informed it was the line for Game Grumps, and that some people had been waiting since the early afternoon. One enthused attendee went so far as to say that Game Grumps was responsible for selling half of the MAGFest tickets. I walked a little further down the line and was shocked that it wrapped around the corner and into and out of multiple breakout rooms. Maybe she was right? Referring to my schedule I decided it was time to see what the M in MAGFest was about. The Megas were about to take the stage at Concert Hall so I made my way to the music room. Entering I was struck by two things: the sheer size of the Concert Hall (it was even larger than the cavernous gaming room) and the two stages on opposite ends allowing for near seamless transition between bands and artists for a constant beat of music. As the night progressed, crowds of people would shift from one end of the room to the other, positioning themselves prior to the end of one band to get a prime spot close to the stage for the next. 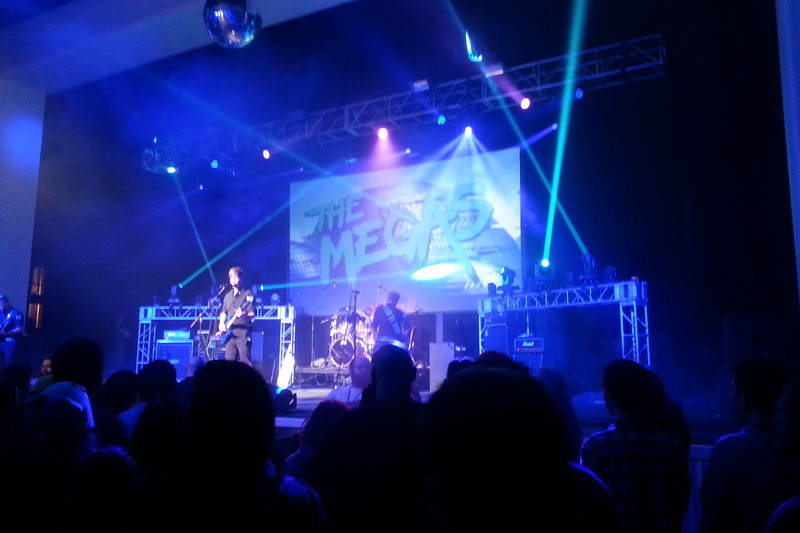 Then The Megas took the stage. Playing music from games like Mortal Kombat and other classics they filled the room with great sound and energy. Powerglove took the stage next also rocking the crowd. I was most impressed with what came next, however. At 10:20 Bit Brigade took the stage. Before starting they surveyed the crowd asking if people knew their act and then explained it: They will play the music to an old NES video game WHILE one of them actually plays through the game as fast as they can, and the game is projected onto a large display behind the band for the entire crowd to view. The music pace and cues are entirely triggered by the gameplay, providing a unique challenge to the musicians to both watch the game in progress and transition musically on time and tempo as required. Seeming to have a repertoire of games and music to pull from, including Contra which I hoped they would, Brit Brigade chose to play through Metroid and performed masterfully. It became clear to the audience we were in the presence of both a talented video gamer who ran through Metroid in just about an hour and also a well rehearsed and cohesive band of talented musicians. Brit Brigade received a well deserved cheer at the end, and I’d go watch them again (as long as it isn’t Metroid). 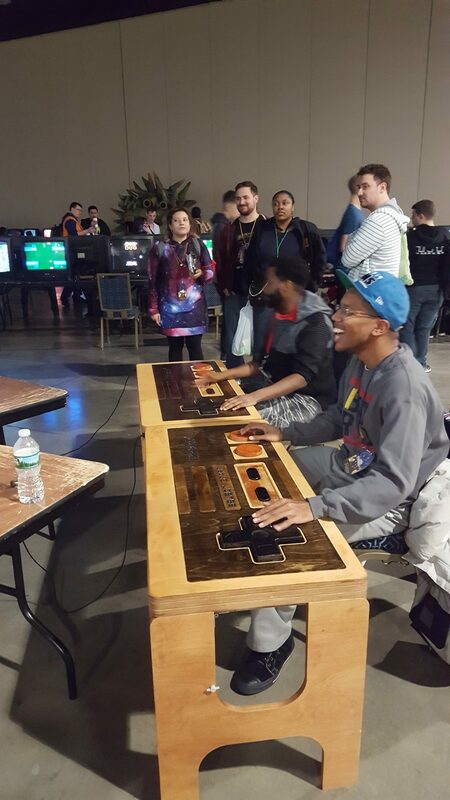 To conclude, MAGFest delivered on its promise of being a music and gaming festival, but it is really much more than that. It is multifaceted, special, unique, and awe-inspiring. It is like a place where you vacationed once, and desperately want to return because you didn’t have time for everything. In the case of MAGFest 13 there is no return. Just the memories of excitement, fun, and wonder, and the hope that next year you’ll somehow have more time to take it all in.